Poulsbo resident John H. Sagdahl, 89, died of complications from cancer Saturday at his home. He was born in Seattle to John and Hanna (Anderson) Sagdahl. 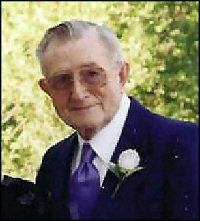 He was raised in Ballard and graduated from Ballard High School in 1936. He also attended the University of Washington. On May 31, 1942, he married Helen Amelia Andersen. He served in the Navy from 1944 to 1947, reaching the rank of radar technician petty officer third class. He served in the Hawaii, the South Pacific and Japan. He later worked at Keyport Naval Torpedo Station for 30 years before retiring in 1974. Survivors include his wife of Poulsbo; his sons, David J. (Kathy) Sagdahl, Paul R. (Mickey) Sagdahl; a daughter, Nancy J. (Richard) Sleeper; his grandchildren, Kimberly, Raymond, Chardon, Kelly, Andrea, Christopher, Jeffrey and Scott; and nine great-grandchildren. Service: None. Inurnment: Miller-Woodlawn. Donations: Hospice of Kitsap County, 3100 Bucklin Hill Road. No. 201, Silverdale, WA 98383.